Cardiovascular disease morbidity and mortality cost some countries around 20% of health budgets - it doesn't have to. Cardiovascular disease (CVD) - including heart disease and stroke - kills more people globally than any other disease, with around 80% of these deaths in LMICs. Addressing key modifiable risk factors such as tobacco use, diet and physical activity would mean most premature CVD deaths could be avoided, and rising mortality rates could be reduced. Deep vein thrombosis and pulmonary embolism (blood clots in the leg veins, which can dislodge and move to the heart and lungs). Cardiovascular disease (CVD) is the number one cause of death globally. In 2008, an estimated 17.3 million men and women died from CVD, representing 30% of all global deaths, 4/5 of which were in LMICs. An estimated 7.3 million of CVD deaths were due to coronary heart disease and 6.2 million were due to stroke. If current trends are allowed to continue, annual CVD deaths are projected to rise to 23.3 million by 2030 (mainly from heart attacks and strokes). Early detection of high CVD risk in primary care settings avails inexpensive treatment to prevent many heart attacks and strokes. Heart attack and stroke survivors are at high risk of recurrences and subsequent death, although these risks can be lowered with a combination of drugs – statins to lower cholesterol, drugs to lower blood pressure, and aspirin. Surgical operations are sometimes required to treat CVD, with varying complexity from coronary artery bypass to heart transplantation, and artificial heart operations. Medical devices are required to treat some CVD, including pacemakers, prosthetic valves, and patches for closing holes in the heart. In some cases, determinants of CVD include poverty, stress and hereditary factors. However the leading risk factor for CVD is high blood pressure, also known as raised blood pressure or hypertension, with one in three adults being affected. It is often referred to as the “silent killer” as many people are not aware they have it, yet it causes 9.4 million deaths each year including 51% of deaths due to strokes and 45% of deaths due to coronary heart disease. Most CVD can be prevented by addressing risk factors such as avoiding tobacco use and second-hand smoke, ensuring healthy diet and body weight, maintaining regular moderate to vigorous physical activity, lowering blood pressure, preventing and controlling diabetes and keeping blood-lipid levels low. CVD expenditures vary from country to country, but most countries spend 8-22% of their health budget on CVD. These costs could be considerably reduced with policies that create environments which make healthy choices affordable, available and sustainable. This World Heart Day, the World Heart Federation (WHF) is advancing the prevention and control of cardiovascular disease (CVD) by investigating gaps and opportunities in global monitoring and surveillance systems for health. This policy brief begins their research. World Heart Day campaign 2017 invites people around the world to share their tips for a healthy heart on World Heart Day – 29 September. World Heart Day takes place on 29 September every year and is a chance for people across the globe to take part in the world's biggest intervention against cardiovascular disease. Do you know how heart healthy you are? 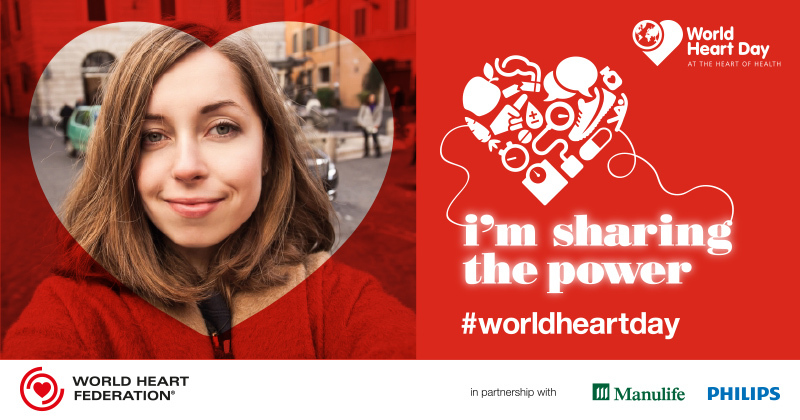 With World Heart Day 2016 fast approaching the World Heart Federation is urging people across the globe to take a closer look at their heart health and consider changes they could make to power their lives more effectively. World Heart Day takes place on 29 September every year and is a change for people across the globe to take part in the world's biggest intervention against cardiovascular disease (CVD).